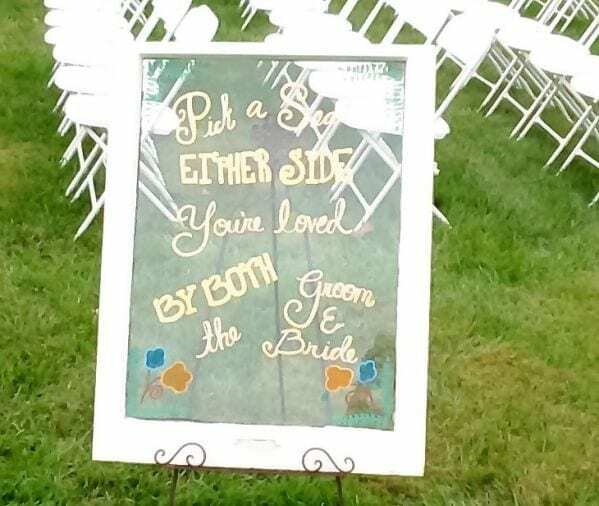 The bride called it “The wedding of the century” in her Facebook review. 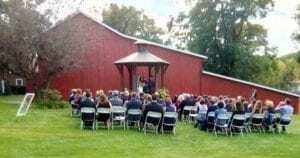 The Barn at Stratford is so pleased that her special day was that special to her, their family and friends. 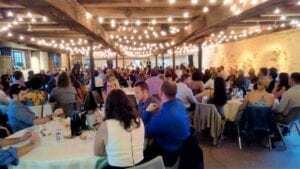 The wedding on Saturday October 1, 2016 was a daylong celebration of activities that lasted long into the night that included 240 celebrants. Before the wedding, the bride sent out a “Wedding Timeline” to her entire team, including The Barn at Stratford, so that everyone would know “What”,”When”,”Where”, and “Who” about the preparation and wedding activities. 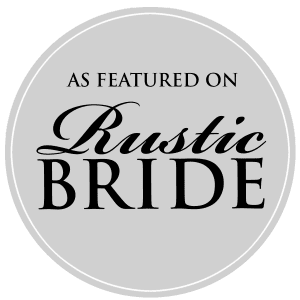 That teamwork and planning was evident as the setup team arrived and began transforming the Barn into just the wedding venue the couple imagined. The Entry Hall contained two tables. 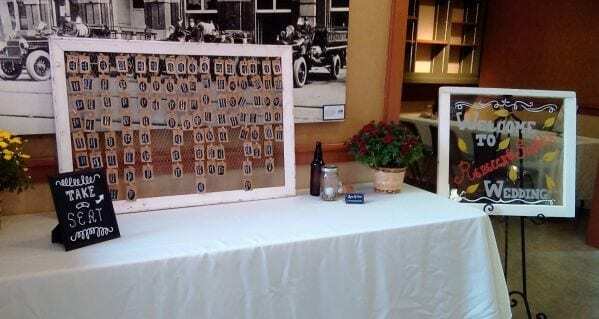 A Welcome Table offered a greeting from the bride and groom, and personal seating tags for each guest. 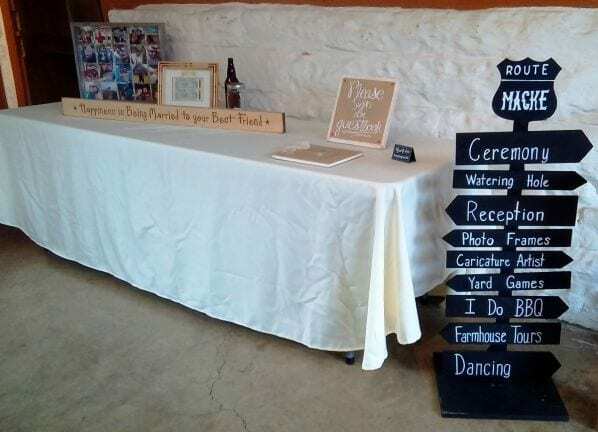 A Registration Table with a “Route Macke” direction sign, information about the couple, and a guest register. 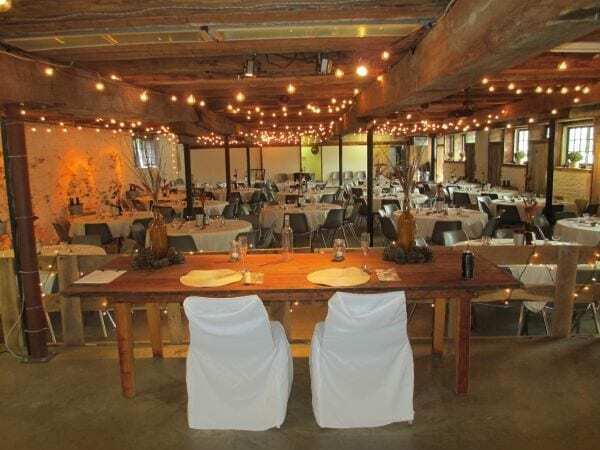 The Barn’s Gallery was set with twenty tables each decorated and a farmhouse table for the special couple set on the Stage. In the bright sunshine of early afternoon, some eighty family and friends gathered on the lush lawn in front of the Gazebo. The window pane told everyone to “Pick a Seat” “You’re Loved by Both”. Music filled the air as Minister Brandon transformed Scott and Rebecca into Mr. & Mrs. While the bridal party was busy with endless photoshots. The guests had a choice of activities. 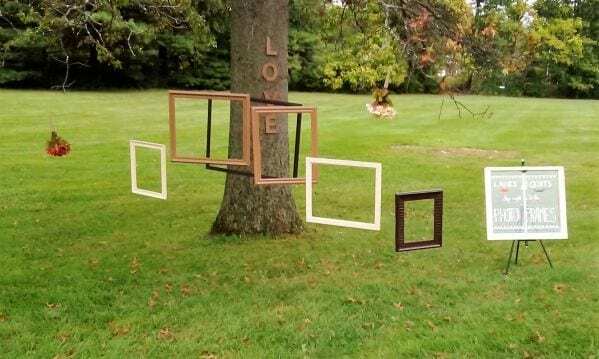 Some stayed outside to take their own photos using the “Tree of Frames”. 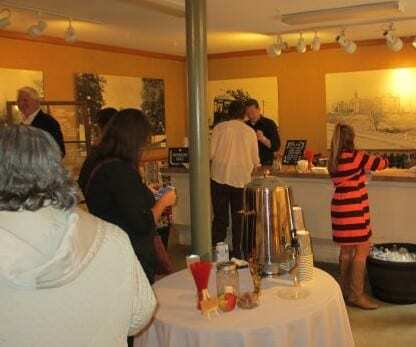 Some guests found their way to the Barn’s West Gallery offering beverage service and hors d’oeuvres. 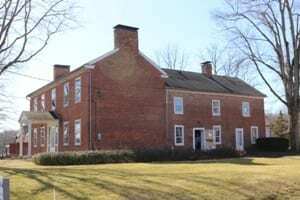 A number of guests took docent-lead tours of the historic Meeker Homestead Museum and its current exhibit of Political Memorabilia. 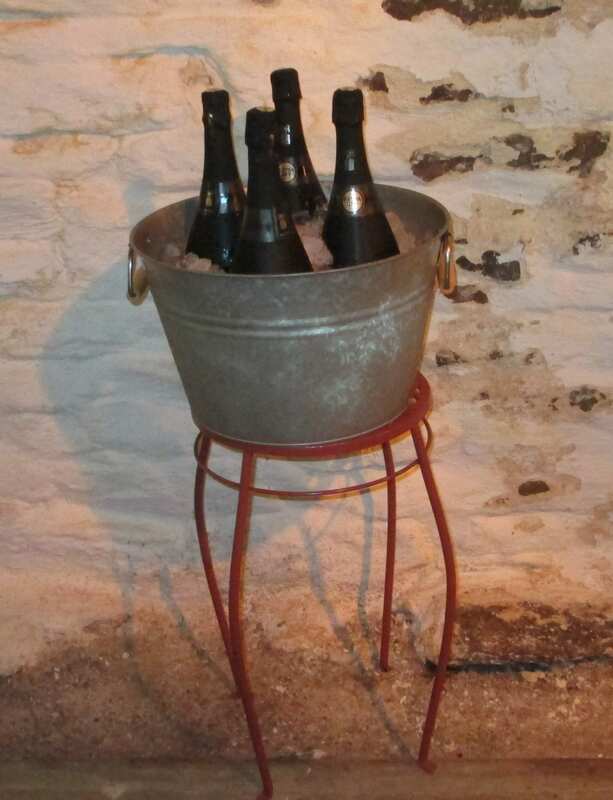 When the wedding couple descended into the Barn’s Gallery, the celebration began in earnest. Everyone toasted the new couple with champagne. Hoggy’s Catering served up their famous buffet with Smoked Beef, BBQ Pulled Chicken, Cheesey Potatoes, Veggy Succotash, and corn muffins. 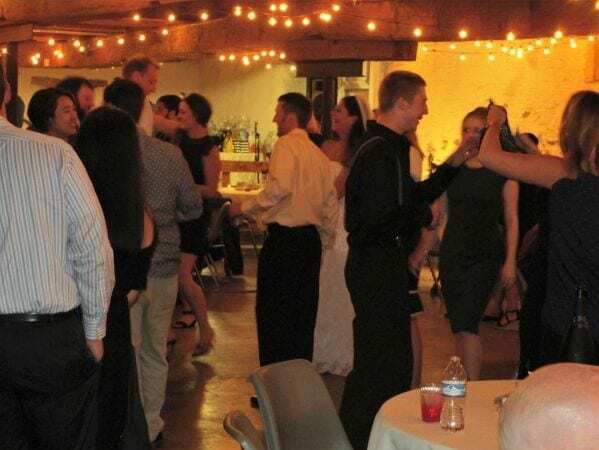 As the final guests arrived, the DJ Mike Christian brought up the Dance Party music and the new couple danced their first dance together, then with parents, then they beckoned everyone to join them. This was the most beautiful venue for our special day. 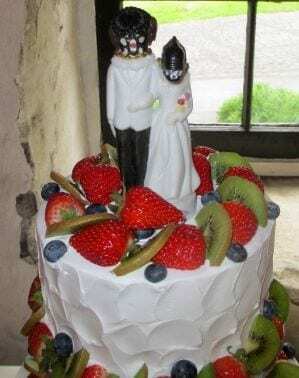 The wedding of the century! 10-01-16. A huge thank you to Connie for being so helpful and helping to make it the best day ever! The Barn at Stratford was a perfect venue for my Son’s special wedding day. Everything was super clean and inviting. The barn holds more people than it appears it would. The owners/staff were great. 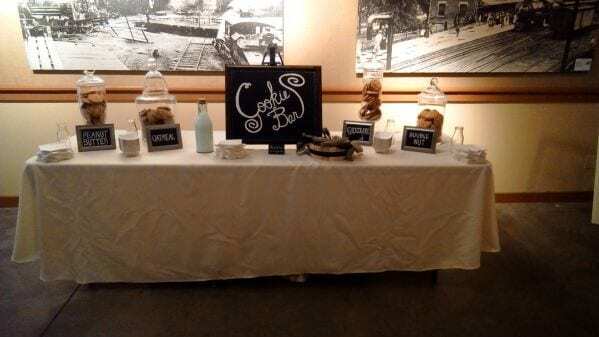 I would recommend this for your next event! Our wedding was THE BEST! Everyone had an absolute blast. It was absolutely perfect and count not have gone any better than what I had imagined. We loved it. We will always look back and think about how perfect it was. Thank you so much for everything that you did for us. You helped ma sure that it was our best day ever and we could not have done it without you. We have spoken about you several times today and what an awesome experience you helped make.